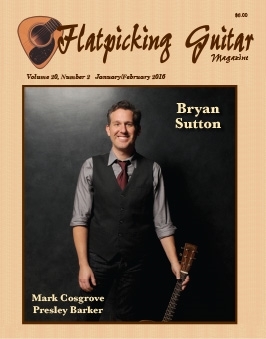 Welcome to Flatpicking Guitar Magazine Volume 20, Number 2, the January/February 2016 edition. In this issue we feature the great Bryan Sutton on our cover. We also feature former National Flatpicking Guitar Champion (1995) and member of the David Bromberg band, Mark Cosgrove. Additionally, we introduce to you an incredible eleven year old flatpicker from North Carolina, Presley Barker. Our regular cast of columnist also provide you with great material to work with this winter season. We hope that you enjoy this issue of Flatpicking Guitar Magazine.